This beautiful 1 story property in the new residential development is situated in a green environment, with plenty of palm trees, and has a private, exclusive feel to it. 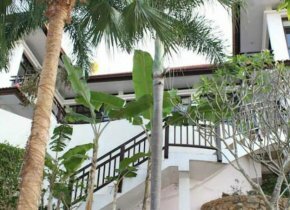 Built on a 800 sqm plot of land this charming villa is located on an east facing slope, allowing guests to enjoy stunning views of crystal-clear waters of the Gulf of Thailand. The property features 3 en-suite bedrooms, 1 additional bathroom, living room connected with a kitchen area, a beautiful 55 sqm terrace with a private 45 sqm swimming pool and a parking space. This modern villa has a breathtaking view of the sea from the living room, and adds chic to this already inspired space. Bedrooms are well-set apart and each contains toilet, washbasin and shower, with high quality fixtures and fittings. The swimming pool lavishly built of smooth stone which has been imported from Bali is the perfect spot for family and friends for enjoying the endlessly sunny days. The bright interior is extremely well designed, featuring plenty of tropical hardwoods and each room is softly lit giving it a laid-back atmosphere once night begins to fall. Mod cons figure throughout the property, giving a sophisticated, highly contemporary feel to the residence. This being the tropics there is deliberately a blurring of indoors and outdoors, large windows and slide-open doors allow owners to go from inside to outside without really being aware of crossing thresholds. Soft breezes and a few fans will mean that the villa remains at a comfortable temperature. Living here is stress-free, and will enable residents to feel relaxed and at ease.